The Boxx Apexx 2 workstation is what any serious CAD, multimedia, and video designer needs to have in their workplace to increase performance and productivity. The Boxx company offers many different high performance and rendering systems that include workstations, virtual solutions, server-based rendering solutions, and simulation solutions. The Boxx team builds custom machines that focus on AutoCad, 3D, VFX, animation, multimedia, video editing, video game creation, and more. The Boxx Apexx 2 workstation (starting at $2,086.00, £1399.43, AU$2739.58) is a wonderful purchase for anyone who is looking for a computer that can produce amazing performance for AutoCAD and 3D modeling applications. Competing in the same arena as top-tier workstations like the Fujitsu Celsius W530 (around $2,160, £1,430, AU$2,680), the Dell Precision T7610 (about $3445, £2027.40, AU$3660), and the Mac Pro, ($2,999, £2,499, or AU$3,999), the Apexx is an underdog that holds its own very well. You aren't buying this workstation for its looks. Built like any old standard rectangular mid-tower desktop, the Apexx has no visual differentiators from most of the desktop computers you used in the early 2000s. It features a black chassis with a black vent that covers about 70% of the front side. Above the vent is a power button and a rewriteable DVD drive. Beneath the drive you'll find two USB 2.0 ports and two USB 3.0 ports. On the back of the Apexx 2, there are four USB 2.0, four USB 3.0, an HDMI port from the video onboard, an 8-channel audio connection, a gigabit ethernet input, and an S/PDIF Out (Optical) port. So, you're not looking at something very pretty, but never mind that - you won't find yourself disappointed once you plug in. 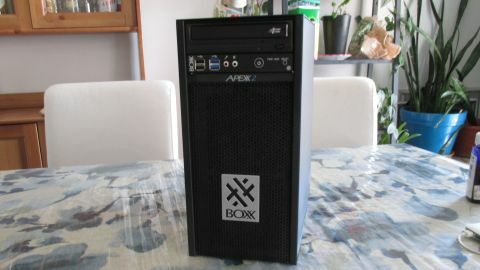 The Boxx Apexx 2 Workstation features the latest 4th generation Intel Core i7 and Intel Xeon processors. The machine can take up to 32GB of DDR4-2133 RAM and it supports full-sized professional GPUs. Internally, the Apexx 2 that I was given has an Asus Gryphon Z97 socket LGA 1150 motherboard that offers incredible performance. On top of the motherboard is the processor, which is fitted with an awesome water-cooled kit that exhausts on the bottom rear of the case. The Apexx 2 comes with two hard drives, a 256 GB SSD SATA III for the OS and a 2TB 7200RPM drive for data storage and general files. This allows you the performance of using AutoCAD and rendering high end files and being able to store huge renders on your secondary HDD. With regards to graphics, the Apexx features an NVIDIA Quadro K5200 8GB PCI-E installed and, if/when the time comes, the Apexx 2 can support two Quadro GPUs as the box does come with an SLI connector. The NVIDIA Quadro has two Display Ports, one DVI-D port, and one DVI-I port. And powering this whole thing? Well, a simple 555w power supply. Now, remember, this is customizable, so you can change processor, add more hard drives, and a secondary GPU.